Reasons to downsize your art collection may include fine-tuning a focus of a specific style, time period, or artist. You may be downsizing because you learned your family members have no interest in certain pieces as you were planning the future of your estate. Or, you may have discovered an opportunity where your collection can be appreciated by a broader audience. There are a number of reasons that could lead you to donate your artwork. The first step to downsizing a collection is tracking down and compiling the provenance documents, artist name, materials used, recent appraisal, and dimensions. With diligent attention to these documents in your Artwork Archive collection inventory, you can easily locate and export everything you need to prepare ahead of time. Additionally, these documents will also be important when filing your taxes in April. And, not all museums will accept your gift. Donating art is a two-sided decision. Museums generally have a committee that reviews gifts and decides whether they are a positive addition to their current collection. Even if your gift is accepted, it is possible that it will be brought to storage and not displayed. You might only be comfortable donating the art on the condition that it is on display. You may also have specific requirements for the display such as including your name or seeing your piece in a certain wing. It is necessary that you specify this in the donation agreement. If you are concerned about donation requirements, you can work with an art advisor on prospective museums that would be a good fit to house your collection. An unconditional gift means there are no stipulations the museum has to abide by. As discussed above, a condition would be something like displaying the artwork in a specific wing. You must also prepare for the fact that an unconditional gift could result in a sale on the museum’s behalf. When you agree to donate the piece as an unconditional gift, you are giving up all rights to the artwork. The Museum of Modern Art in New York, for example, only accepts unconditional gifts. This is also called “unrestricted status.” Museums generally prefer that donations come in with zero requirements. This means, your piece can be displayed wherever the museum chooses, stored wherever and whenever, or sold at any time. When donating your art you may feel like the museum is your partner. After thoroughly researching your options and agreeing to relinquish a treasured item, it’s natural to feel this way. However, as a donor it is important to understand the relationship that the museum is willing to participate in. Unfortunately, it is possible that the museum is not willing to support any relationship. The museum may take the donation and forgo any further communication about the piece. At the time of the donation, you may be informed of where the piece will be displayed and for how long. Curators usually have a good idea of the plan for a new piece of art. That being said, things change. When coming from a private collection and starting to work with a larger institution, new management and goals can affect the future of your piece at the drop of a hat. Once you have donated the artwork, the exhibit may change or your piece may be moved into storage. Regardless, you have positively contributed to the museum’s collection. In the event of a large donation, it’s understandable that you want the grouping of your art to be respected. You curated your collection with intention. Especially when choosing a museum with a similar taste, you may assume that your pieces will be displayed together. This is is not always the case. The museum also may only accept parts of your intended group gift. Although you’re hoping to keep certain pieces together, the museum may only be interested in specific works. If you are looking to donate art and are not concerned with it’s whereabouts, you can donate to a charity. There are many charities that accept art donations. The art will likely be sold at the organization’s benefit. 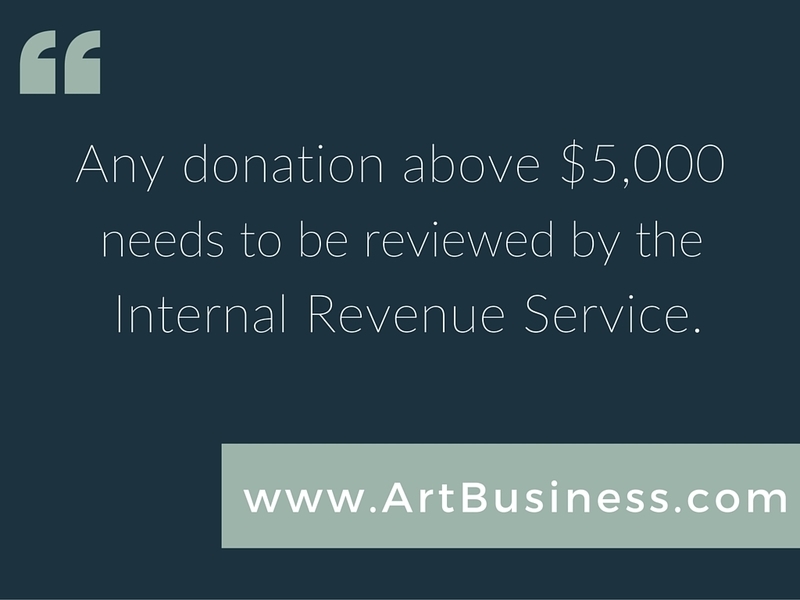 Any donation above $5,000 needs to be reviewed by the Internal Revenue Service, according to Art Business. Make sure you consult with your tax attorney and file the appropriate forms. Be sure the value is up-to-date and done by an experienced appraiser. You can be penalized for misstating values in a donation. You also want to be sure that you receive the correct, and most beneficial, tax deduction. When you are downsizing your art collection, it’s best to understand your options. You put a lot of time and emotion into making these purchases, and your collections deserves the same attention when it comes to finding a new home for all or portions of it. If you are forthright about your needs and concerns, you will find an amicable candidate to acquire a precious part of your art collection. Otherwise, you can explore options for selling artwork compared to donating. Take time to explore your options, and the best decision is the one you are confident will carry out the vision you have for your collection. Want more about donating, lending, and insuring works in your collection? Download more collection tips and know-hows in our Essential Guide to Collecting Art. What young audiences see in books and learn in school about contemporary art history is often the result of passionate, private art collectors. Thinking about experiencing new art fairs this fall? Here are four fairs worth the trip! Even the most fastidious art collectors can fall victim to an expensive disaster if proper attention isn’t paid to the art. Do You Know How to Choose the Right Art Restorer? Get inside the mind of an art restorer to find out tips like how often your art needs to be cleaned.